To ensure you see major changes to your site, or to help troubleshoot issues, it’s important to delete or purge cache in the three main places it processes. 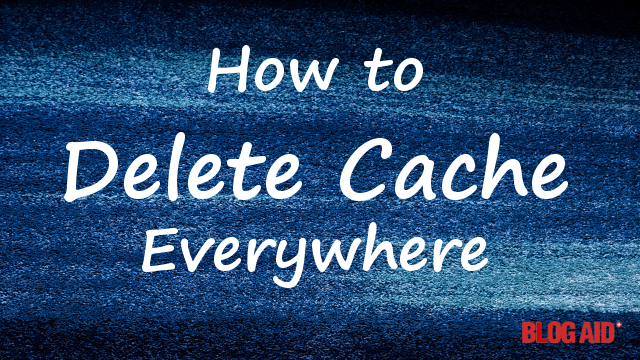 See how to easily purge cache on your browser, local caching plugin, and CDN like Cloudflare. Basically, it’s a preloaded copy of your site’s elements that allow them to be delivered faster. We’ll cover how to purge the first 3 in-depth and cover the basics of the last 2, as they will vary widely for all users. Any of the above cache locations should automatically refresh periodically to ensure all site visitors see the most recent changes to your site. Intelligent Caching is a method employed by all of the above locations to detect when you change something on your site, which should trigger a purge of the cache. Unfortunately, for deeply cached elements, like your logo that appears on every page, it may take hours (up to 10) to fully purge everywhere on its own. You can also force the caches to update on demand by purging them. This rebuilds all of the cached elements anew. And that’s what this tutorial addresses, to ensure you see the latest version of your site. FYI, your local caching plugin and Cloudflare should bypass caching for Admin users, if you have all of your settings correct. That means when you are previewing your site pages while logged in, you should not see a cached version from your plugin or Cloudflare. However, your browser will eventually cache. Note that I said Admin users, not all logged in users. There’s a BIG difference between those. This tutorial addresses purging cache for regular site visitors – meaning non logged in admin users, including you seeing your site as a visitor would see it. 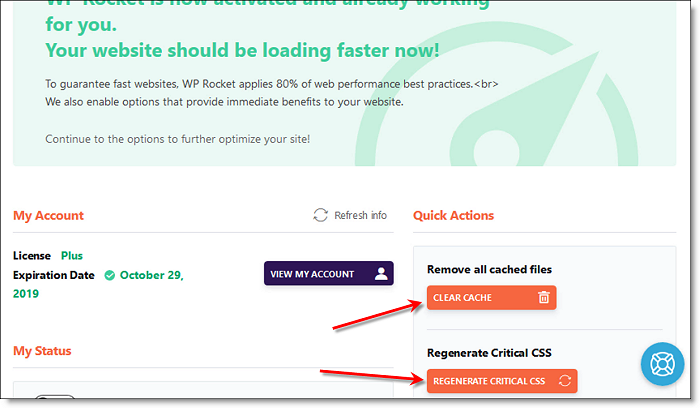 Following are the steps to take to purge cache on WP Fastest Cache and WP Rocket. NOTE: There are 2 purge settings in each plugin. Read the details below to see if you need to purge both. NOTE: Purging cache means that your site load time will slow down a bit while the cache rebuilds. It should take no more than an hour. Go to the WP Fastest Cache tab in your left Admin sidebar, or use the Clear Cache tool in your top Admin bar. Go to the Delete tab. To delete the standard cache, click the Delete Cache button. If you are using the Minify and/or Combine settings, you will need to click the Delete Cache and Minfied CSS/JS button. It will take a bit of time for the Minified and Combine Intelligent Caching to rebuild. You may see a notice that it is doing that. READ: How to Configure WP Fastest Cache Settings for more details. From your Dashboard tab you’ll see two orange buttons in the lower right. To purge, click the Clear Cache button. If you are using the Minify and/or Combine settings, you will need to click both buttons, including the Regenerate Critical CSS. It will take a bit of time for the Minified and Combine Intelligent Caching to rebuild. You will see a notice that it is doing that. You can purge the cache from within your Cloudflare account. But an easier way is via the Cloudflare plugin. From the Home tab, click the Purge Cache button. A pop up will appear asking you to confirm, do so. A message bar at the bottom of your screen will appear to allow at least 30 seconds for the purge. In reality, it can take up to an hour for Cloudflare to purge most of its mirrored sites around the globe. And, it may take a full 10 hours to deeply purge and rebuild the cache everywhere. You can clear your browser’s history/cache, but that will not ensure you will see the latest version of your site, mainly due to all the cookies. So, you will also want to use an incognito or private window for viewing. TIP: Incognito and Private browser windows will eventually cache too. So, visit no more than 2 pages/views and then open a new incognito/private window to do additional page views. 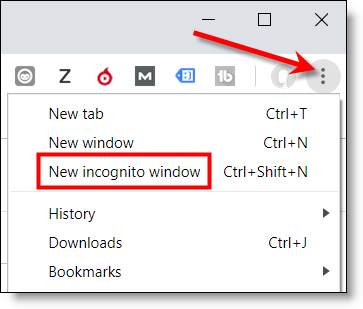 From the drop-down, select New incognito window. Find the 3 bar menu in the upper far right and click it. 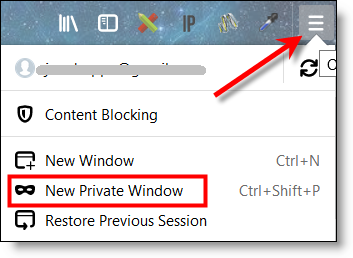 From the drop-down, select new Private Window. Chrome and Firefox are the best browsers to use while working with WordPress. Safari, and especially Internet Explorer, can give odd returns and you may not even see all of the functions available while editing in WordPress either. You may or may not be able to purge the cache held on your host server. Fortunately, in most cases you will never need to touch it. Unless you have 250,000 hits or more a day, you’ll also likely never see the benefits of server-side caching. So, I generally recommend turning it off, as it can cause major conflicts with page caching in local caching plugins. In all cases, I have been able to make a site run faster with server-side cache turned off on shared hosting, as well as Managed VPS hosting. If you have a dedicated server, there are other combos of settings to help you gain the most speed while preserving your hosting resources. On rare occasion I’ve had a site get cached in my ISP’s hub and it simply would not clear. No matter how may changes I made on the site, I could not see them. And easy way to run end around your ISP to verify that it is the problem is to use your 4G/LTE service on your mobile device, rather than your wifi, which is coming through the same router as your desktop/laptop. You may need to do a DNS flush on your computer to try to dislodge the stuck cache from your ISP. You’ll want to Google how to do that for your type of computer and OS (Operating System). And there is no guarantee that it will be flushed. You can also call your provider and see if they can manually flush the hub. Caching configurations can be tricky, as you need to match your host server type to be most effective. And, some combos of settings can make or break your site too. Plus, the underlying internet super highway through which our site data travels is changing all the time too, and your cache settings have to keep up. A site audit will show all of the speed drags on your site, and help identify the best caching methods and combos for you to use.